This article briefly describes our successful experience of implementation “tracking of moving objects” algorithm as a part of intelligent video analysis solution. It contains high level instructions how to “convert” a video stream into a list of tracks of moving objects. Detecting any type of motion and making camera shots. As an input, we receive a stream of frames (images) captured from a video source (for example, from a video file or a web camera). The algorithm should gather information about moving objects (size, trajectory, etc.). Matching moving objects between consecutive frames. Let’s consider each part separately from each other. There are several approaches to motion detection. Most of them are based on comparing a frame of the video with the next or previous frame (or with the background). In our approach, we use an original background subtraction algorithm. Before subtracting a current frame from the background, we perform a gray scaling of it (Figure 1). Different video sources might have different format of frames. Thus, we have decided to work with gray-scaled frames. We separate motion detection part into two steps. If the difference for particular pixel is greater than 0 (zero), then the correspondent pixel in the background frame becomes more solid (whiter). Otherwise – weaker (blacker). Marks pixels with difference greater than the specified threshold with a foreground color – white. All other pixels are marked in black. Therefore, an output of the first step will be a binary frame with only two colors: white and black (Figure 2). Let’s call it – foreground mask. The second step applies morphological operations to the resulting foreground mask to eliminate noise. For this purpose we use an erosion filter. The erosion filter removes pixels that are not surrounded by enough amount of adjacent pixels. The foreground mask is processed pixel by pixel and, if an enough amount of pixels in the current window (we uses 3×3 window) are not white, then the entire window will be black. Thus, the noise (stand-alone pixels) will be eliminated. Also, to keep object’s edges we apply a dilatation filter to the same 3×3 window. Figure 3 shows the result of the motion detection part – filtered foreground mask. Centroid – point, the center of a blob. Let’s call this object – track. 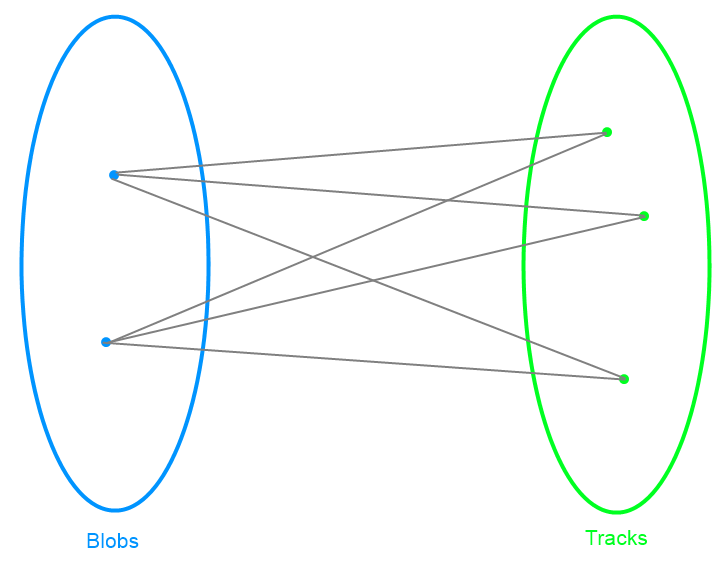 Thus, each track will correspond exactly to one blob and vice versa. Before adding a blob to the result list, we check, if its size satisfies our expectation. Figure 4 shows the visualization of the foreground mask after the blob analysis. We make Bounding boxes red for visualization, but any action can be applied to tracks and recognized objects. of the interference (trees, buildings, etc.). The association of detection (blobs) to the same object (track) is based on motion. We use Kalman filter to estimate the motion of each track. The filter is used to predict the location of a track in each frame. A track is unassigned. Mark this track as invisible. A blob is unassigned. Begin new track with this blob’s data. Each track has an amount of invisible (marked as invisible) consecutive frames. If its amount exceeds a specified number, then the algorithm deletes the track. In this part of the process, the well-known problem appears – assignment problem (blobs to tracks). First, we build a bipartite graph: we have a source S, a sink T, in the first part we place N vertices (corresponding to blobs), in the second – M vertices (corresponding to tracks). Each blob has an edge to each track and vice versa. The weight of the edge is a distance between centroids of a blob and a track. Schematically, it looks like on the Figure 5. Then we use the min-cost-flow algorithm to solve the current problem. The assignment problem can be solved by another well-known algorithm –Hungarian algorithm (aka Kuhn–Munkres algorithm). For each track, we keep count of the number of consecutive frames, where it remained unassigned. If the count exceeds a specified threshold we assume that the object left the field of view and delete the track. Collected information allows us to analyze trajectories of moving objects (Figure 7). to detect movements in specific areas. 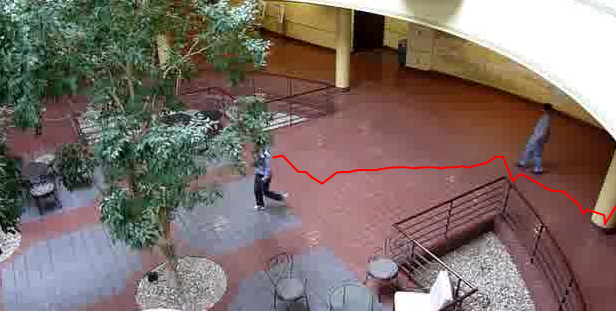 Here is an example of running Matching Moving Objects between Consecutive Frames on the video stream. In this article we made an overview of our algorithm used to detect motion and keep tracking of moving objects on the video stream. It is very informative . Can we have the source codes for linux environment to play with it ?